Batavia, Ohio – Milacron, a U.S.-based, worldwide supplier of plastics-processing technologies, will be running the all-electric Roboshot S-2000i55B injection molding machine in full-scale operation at NPE2012 from April 1-5 in Orlando, Fla., booth #2803. Attendees can see for themselves Roboshot’s renown benefits – including higher speeds, better quality production and lower energy use – as the machine makes inserts for the medical market in a 2-cavity Liquid Silicone Rubber (LSR) cold deck from Roembke Manufacturing & Design, Inc. 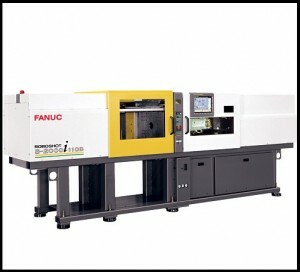 The system will also feature an Avalon vision inspection system and Fanuc’s 31-iA control system – which provides the industry’s fastest scan rate, at 62.5 microseconds. The result is high-speed, precise production that’s especially well-suited for medical product manufacturing and other sophisticated applications requiring clean production, repeatability, ease of validation and tight tolerances. • Better part quality: Improved base rigidity along with a two-piece platen design provides less platen deflection than conventional toggle machines, solidifying the molding process and resulting in better part quality. • Quieter operation: Enhanced belt design provides improvement in noise reduction, allowing the machines to run faster, quieter and with high reliability and precision. • Faster cycle times: Improved clamp mechanics boost performance and reliability, and Artificial Intelligence (AI) supports superior mold protection at faster cycles. • Lower maintenance costs: The multi-circuit lubrication system brings greater machine reliability, along with lower maintenance and lubricant costs. • Reduced energy usage: The TCS (Thermal Control Solution) Heater Band System provides measurable energy efficiency by using radiant heat that goes directly into the barrel and not into your plant, resulting in energy reduction by up to 50 percent. For more information, please visit www.milacron.com/roboshot1.